Goodreads’ Book Description:Everyone knows Bone Gap is full of gaps—gaps to trip you up, gaps to slide through so you can disappear forever. So when young, beautiful Roza went missing, the people of Bone Gap weren’t surprised. After all, it wasn’t the first time that someone had slipped away and left Finn and Sean O’Sullivan on their own. Just a few years before, their mother had high-tailed it to Oregon for a brand new guy, a brand new life. That’s just how things go, the people said. Who are you going to blame? Alex’s Experience:I was hooked from page one of this novel. Although the story intrigued me, it was Laura Ruby’s writing that drew me in. The abundance of beautiful similes and metaphors sometimes made it hard for me to read this book without pausing every paragraph to think, “Damn.” Her descriptions made the whole story so much more vivid and real for me. For example: “The pavement in front of Finn ended in a wall of sky, as if it had been sliced off by the swing of a scythe,” or “The water churned and rushed and sucked and tossed him, and strange yellow eyes watched him from the sky and from the tall banks, and black shapes writhed under the surface of the river and brushed and bumped against his body – ridges of bone, sandpaper skin, the brief press of teeth that tested, tested.” Damn. If the writing doesn’t do it for you, the story will. When Finn O’Sullivan witnesses the kidnapping of his friend Roza but can’t remember the face of the man who took her, nobody believes his story. He’s still determined to find out the truth behind her kidnapping, to remember the face of the man who moves “like a cornstalk twitching in the wind.” Finn’s beautiful and heartbreaking story explores themes of love, loss and magic and will keep you wanting more. 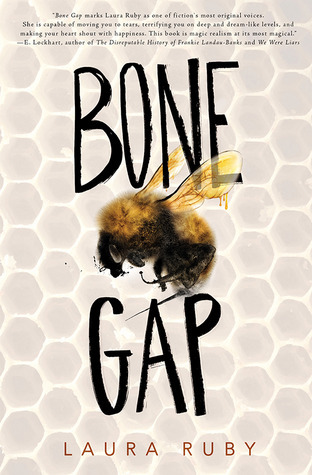 The book switches perspectives every chapter, usually between Finn and Roza, but other residents of Bone Gap make their thoughts known to us as well, like Petey, the beekeeper’s daughter whose tongue is sharper than a bee’s sting and makes a shocking discovery about Finn, or Sean, Finn’s older brother and town hero. This is a novel that really needs these perspectives, because the story isn’t whole without them. This novel seems like a regular thriller/suspense story, but it is so much more than that. As it progresses, you realize there is so much more to Finn, Roza and Petey than meets the eye. Finn isn’t just a spacey, awkward boy. He’s perceptive, loving and surprises everyone in Bone Gap with his determination despite a strange affliction you do not see coming. Roza’s Polish roots seep into every page of her thoughts, and the story wouldn’t be complete without them. She is strong and fights for her freedom with rough, calloused hands and a heart that longs to see Sean again. Petey is tough and hates being in Bone Gap, yet she has a soft spot for two things: bees and Finn. Bone Gap is a thrilling, magical story that will take you through the gaps of Finn’s mind, Bone Gap and the sea of corn that whispers here, here, here. You will escape to another world, and then another world within that one. Brew some coffee with honey (recipe here!) and lose yourself in this book. You won’t regret it.